I like to make things. While I joke that I’m so crafty, I make people (five kids! ), the truth is that I like to put time and energy into things that are creative, crafty, or beautiful. If they happen to be useful, that’s a bonus. I enjoy crocheting gifts for family and friends (especially amigurumi toys for children), take pleasure in feeding a group (even if it’s also stressful), and like to make my own personal care products. One of the first things I did after starting essential oils was whip up my own deodorant. I’d never been able to find one in the stores that didn’t bother my nose to some extent. Deodorant is not a very glamorous DiY, but the internet is teeming with all sorts of fun products for face and body–all using essential oils. Let’s face it, if I’m going to use something on my skin or lips, therapeutic effects are a great bonus! There are so many essential oil recipes out there. Hear how I liked this one. After I started replacing things like deodorant, moisturizer, body cream, face wash, and lip balm with all-natural versions I made myself, I discovered that the store-bought versions weren’t very good for me anyway. The Breast Cancer Fund notes that many common ingredients in personal care products are considered carcinogens. Mia Davis, the head of health and safety for the company Beautycounter, presented to the Harvard School of Public Health, detailing how hard it can be to avoid a constant exposure to unhealthy chemicals in personal care products. The Campaign for Safe Cosmetics lists the chemicals and their concerns at their website, for those who wish to research the topic more. The fact is, beauty products aren’t very well regulated and ingredients don’t always have to be listed on the packaging. This applies to products used by all adults, as well as those intended for children. My DiY fun became more serious after that. I’m not savvy enough to replace my mascara yet, but all the basics I can are being replaced with homemade, healthy, and oil-infused options. However, there are so many recipes out there, it can be hard to choose the best ones. Common natural ingredients like beeswax, coconut oil, and shea butter can react differently depending on the temperature and humidity of the area. Recipes that work great in my cool, dry climate are too heavy for a hot, humid one. Trying out recipes is half the fun, and it’s great to find one I love. Lip balm is a necessity in our area. Summers are hot and dry. Winters are cold, dry, and windy–often windy enough to blow trailers and semis over on the interstate. It’s important to have something on my lips to moisturize and then seal in that moisture. I also wanted something with vitamin E in it, since E is excellent for skin health. The skin on lips is extremely thin and sensitive, and I need industrial strength protection on mine. 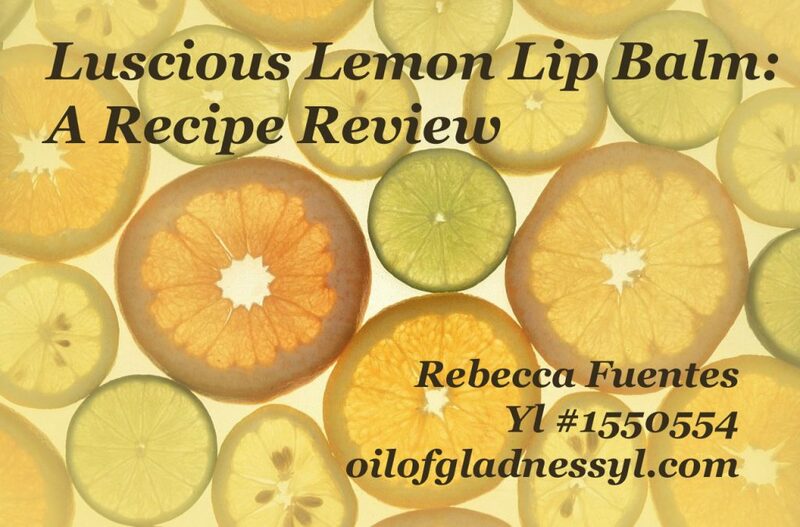 When I ran across the recipe for Luscious Lemon Lip Balm on Pinterest, it sounded like the perfect lip balm for me. Even the name made me want to make it. Plus, I already had all the ingredients on hand! It was the first time I’d seen a lip balm recipe with avocado oil in it, though avocado oil is reputed to be excellent for skin. I bought 6 of the little .25 oz. lip balm containers and made myself up a batch. Does it live up to its name? Is it luscious? It certainly moisturizes my lips, and it keeps them moist for a long time. Even if I go out in the wind, my lips stay moist without feeling sticky. When I first put it on, I thought it would be too thick and waxy. I wondered if the recipe had too much beeswax. After the first few minutes, though, it warms up to my body temperature and feels wonderful. The amount of beeswax means it would probably work in a “stick” type container, not just the little lip balm containers with twist-on lids. I wouldn’t leave those in a hot car in the summer, though! Inadvertently, I discovered that this mix works great on dry hands, too. I put too much on my lips and rubbed the extra on my hands. Hours later, my hands still looked and felt great. However, I don’t like to use citrus oils on exposed skin, because they can cause photo-sensitivity. For skin, I would use an oil that that supports great skin health, like frankincense, lavender, or cedarwood. Ultimately, would I make this recipe again? Yes, I definitely will!